Tarantino's latest sees a band of Jewish American soldiers during World War 2 with a mission to hunt down and kill as many Nazi's as possible. 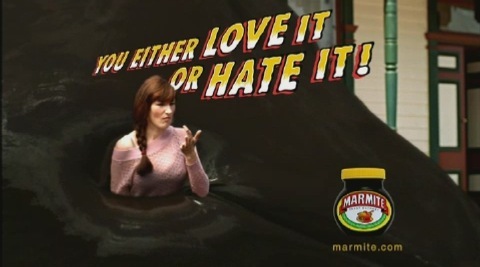 Quentin Tarantino is a bit like marmite, you either love him or hate him. With his unique film making style which draws upon everything from martial arts films to spaghetti westerns, one can't deny the technical prowess and unrivalled attention to detail of this self appointed King of the film geeks. And yet, he has always had his critics. 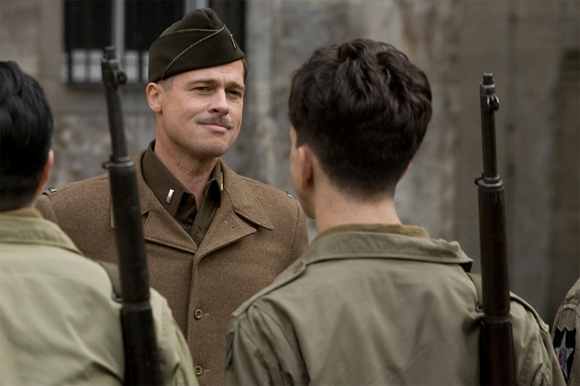 Now he releases Inglourious Basterds, a film that Tarantino has spent more than a decade working on. This is the film that he describes as his masterpiece, the best film he has ever made, the ultimate Tarantino movie, and it is ultimately fitting that the film ends on the line "you know this might just be my masterpiece". But this clearly self referential conceit describes a notion that is made all too evident throughout the film, and one comes away with the distinct feeling that this is a film that means a lot more to its writer than it does to its audience. Make no mistake, with excessive gore, dark humor, and reams of dialogue that borders on self indulgent, this is Tarantino in his element. But this is not his greatest film, and if you didn't like Tarantino before, you won't like him now. First of all I feel it's necessary to clear things up for anyone who goes to this film expecting a 'world war 2' film. I don't think it would be adequate simply to say that Inglourious Basterds is 'historically inaccurate', as I'm sure you've read in other reviews. This gives the impression that this movie is 'inaccurate' in the sense of manipulating small details as pretty much all action films do, but this is just not the case. No, this film is 'inaccurate' in the sense that it takes the history books and sets them on fire. Not giving too much away, but it completely rewrites the ending of the war in such an unexpectedly bold and audacious fashion. It's sort of a 'what if' movie, more than an actual world war 2 film. This is absolutely fine though, I didn't go to Watchmen expecting historical accuracy and I didn't with this film either, and neither should you. It is also important to clear up the nature of this film. Most of you will, as I did, go see this film expecting a 'dirty dozen' type of movie, with a 'rough around the edges' group of badass men on a mission. You'll be expecting this because it's exactly what most critics and previews of the movie have been telling us. But as you should have noticed by now, most film writers are a bunch of miserable cretins who couldn't conjure up an original thought between them if their careers depended on it (which quite clearly it does not). In reality the aforementioned 'basterds' only get a small amount of screen time, and Brad Pitt himself is only on screen in three out of the film's five chapters. Instead, much of the time is spent following the story of Shosanna Dreyfus, played with a sufficient mix of sensitivity and menace by Mélanie Laurent, as she is presented with the opportunity of a lifetime to avenge the murder of her Jewish family at the hands of the Nazis. Indeed, the film seems somewhat unfocused and as rough around the edges as the Basterds troupe it depicts. On the one hand you will have gargantuan twenty minute long scenes featuring nothing but dialogue as in the first chapter "Once Upon a Time... in Nazi Occupied France" and the third chapter "German Night in Paris". Now these are actually some of my favorite scenes in the movie, allowing Tarantino to build the kind of suspense that he is known for through long rafts of verbose, but witty dialogue. As with much of Tarantino's work, the extent of the dialogue occasionally borders on 'too much', on being self indulgent rather than actually relevant. But more than this, the problem is that it contrasts so starkly with much of the rest of the film, featuring a quickfire series of relatively short scenes, which afford little time to actually get to know the characters and learn to care about them. So while the dialogue heavy scenes might be fantastic pieces of cinema in their own right, they're relatively meaningless without a stronger foundation. The strange thing is, that while its clear that the film should have spent more time with the Basterds in the early stages of the film, it's impossible to look at the whole and pick out any scenes that should have been cut in order to make time for this. The problem then, seems to be that this 'magnum opus' that Tarantino has been working on for his entire career, is simply to ambitious, too mammoth a body of work to fit into a single film. Watching this film, one gets the strong impression that what we are looking at is a severely cut rendition of what Tarantino must have originally wrote, and this comes across pretty clearly on screen. And it is to the detriment of the final product that we aren't given enough build up of the character and plot to really enjoy some of the finely written scenes later in the movie. Perhaps it might have worked better split into two 'volumes' like the Kill Bill saga. That being said, one still can't help but enjoy the film for what it is; a highly enjoyable, if brainless, affair. A lack of 'completeness' to the film only slightly undercuts some scenes of expert poise and class that are bound to leave a smile on everyone's faces. More to the point, the performances are generally excellent. Brad Pitt is typically excellent, playing gruff badass Aldo Raine with a fantastically thick Tennessee accent. Pitt shows once again how versatile an actor he can be, and it's amazing now to think that anyone could ever have seen him as 'just another pretty boy' actor. But it is Christoph Waltz who steals the show here. Waltz plays Nazi Commander Hans Landa and gives one of those career defining performances that will almost certainly earn himself an Oscar nomination next year. Waltz plays the roll in ways that no Nazi, or any other character for that matter, has ever been played, ironic, mannered, intelligent and abundantly evil. It is charming and chilling, unique and unforgettable performance, and certainly the most impressive of the year so far. Waltz simply steals the scene whenever he appears. Ultimately this is an extremely enjoyable film and one that deserves at least one viewing. It may not convert those who have already dismissed Tarantino, but for any true cinephiles there will be much to love here.